"In the past, the suburban dad's den may have been the home-office ideal, but space is precious in many homes these days. 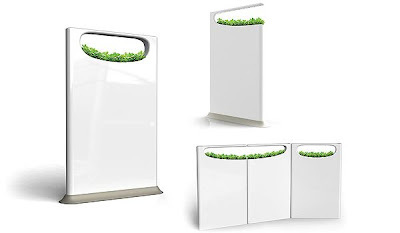 As a result, both designers and retailers are responding in greater numbers to the need for smaller-scale, ultra-flexible office gear." There's some thoughts from some designers (e.g. 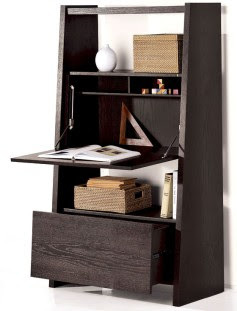 'Go vertical') and some nice suggestions of possible furniture such as West Elm’s bookcase secretary above which they describe as a "complete instant office, designed to hide away when not in use. Flip down the front for a roomy work area and ample space for a laptop, plus shelves that keep essentials in easy reach.". Well worth a browse. Writer Henry James (The Ambassadors, The Turn of the Screw) wrote in a rather splendid garden room, sadly destroyed in a World War II air raid in his home at Lamb House, Rye, a loss which James Lees-Milne lamented in his famous diaries. There's a particularly nice little site dedicated entirely to it (and the work of EF Benson, author of the Mapp and Lucia stories, who lived in Lamb House after James: the photo above is from that site). 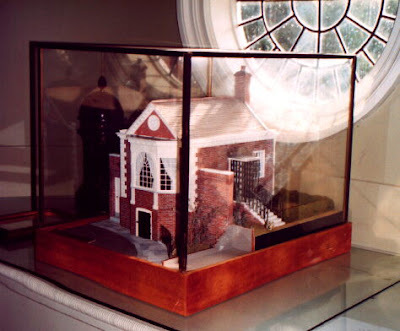 It is now owned by the National Trust who decided not to rebuild the garden house although they did put up a special plaque and small wall indicating its position. The Garden Room, originally known as the Banqueting Room and used for formal entertaining, was built by James Lamb, probably in 1743, the same year as the Town Hall was rebuilt, and under the supervision of the same architect... The entrance was from the garden by a flight of seven steps flanked by iron railings at right angles to the French Window which opens on to the garden from the Morning Room of the main house. The small door underneath the bow-window led to a cellar which in Henry James's time was used for keeping the hand-cart with which Burgess Noakes would convey guests' luggage between the house and the railway station. It was in this cellar that the German bomb exploded in 1940. Apparently James liked having a view of the street so that he could do some peoplewatching when the muse had temporarily deserted him. Andrew Roberts is a musician based in South London. Three years ago, when he needed somewhere to keep his instruments, he found a retailer who was renting rooms as storage space behind Brixton High Street. His guitars and amplifiers were joined by Lambeth Council's parking ticket archive and the cleaning paraphernalia of a man running his company from the space. 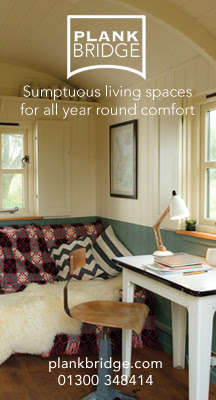 There's also some details about garden offices. 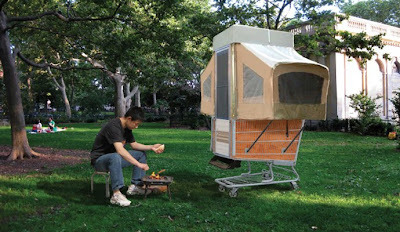 "buBbLe tries to advocate a space and a time for non-permanent dwellings. 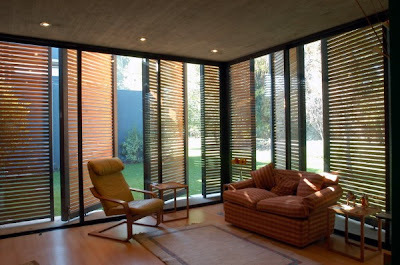 We believe it is possible to create contemporary residential units that penetrate the city’s interstitial spaces. 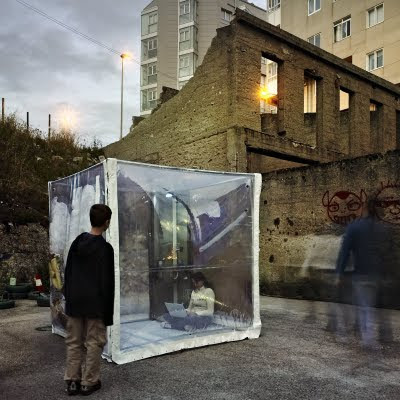 These units would thus complete the city’s functioning and allow for the newly arrived, or displaced people in general, to gradually settle in the city. Semi-regulated spaces that, accepting the transience of new residents, alter their character slightly and contribute to social inclusion." 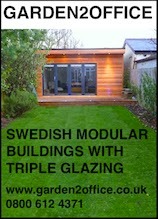 More garden office companies should look into using video to advertise their wares. Woodcraft Construction do a nice job in the video above. 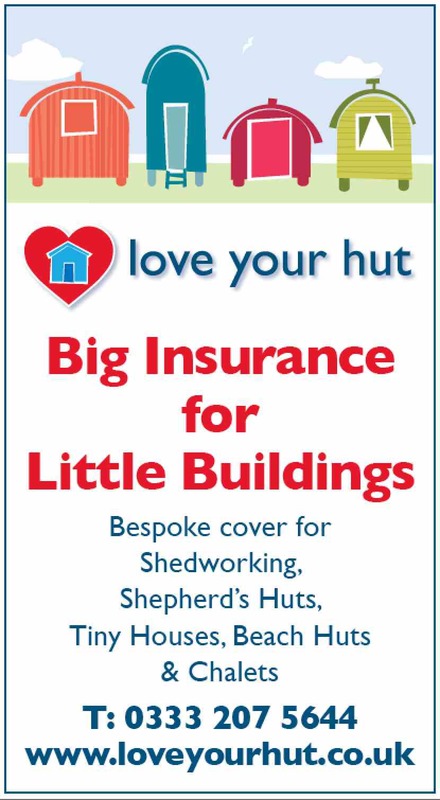 Suffolk Sheds, based on the Suffolk/Essex border, have been building sheds for over 30 years. 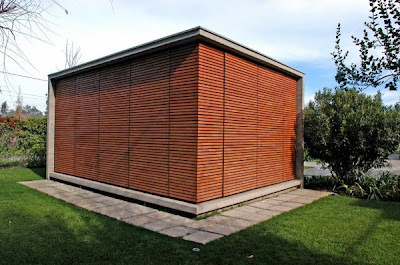 "In recent years we have branched out into building more bespoke and sometimes unusual timber buildings," says Tim James. 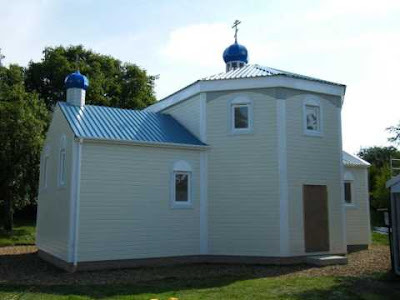 "We have just built a Russian Orthodox timber church, which is in someone’s back garden. 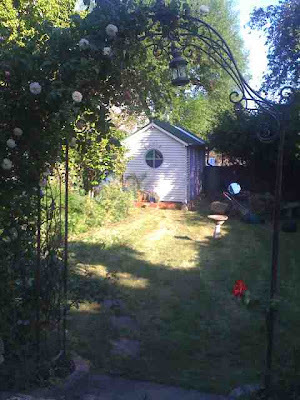 I don’t believe there are many people who have one of these in their garden as a place to work from." I suspect he's right. 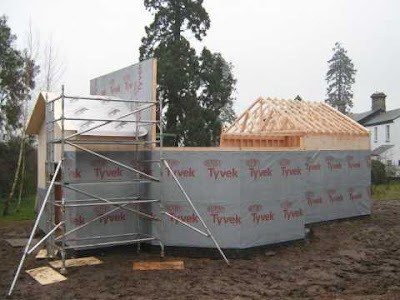 Above is the finished prefab church in the Waveney Valley area, 12m x 5m. You can see photos of the build step by step at the site here. 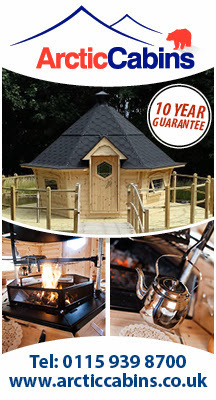 You can commission them to build one for you too along similar lines, although they also offer a bespoke service. 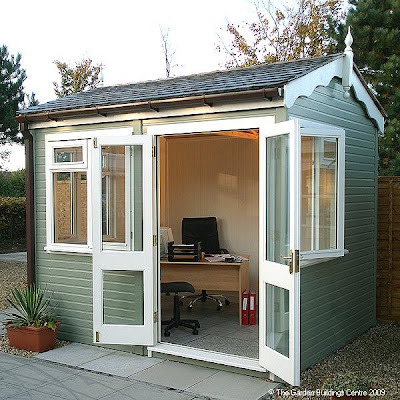 We've been following Jonny Barker's tiny office build on Shedworking and now's your chance to own it. Jonny has put it on ebay and you have a couple of days to make your bid. 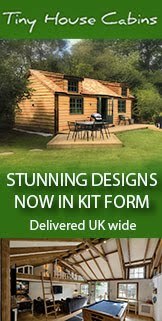 If you're looking for a bargain price, handmade garden office, then you should definitely pop along and consider bidding. 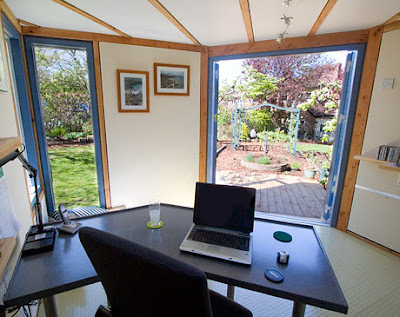 If you share your garden office but want some privacy, then this could be just the thing, a 'breathing partition' which brings a little bit of the garden into the garden office. 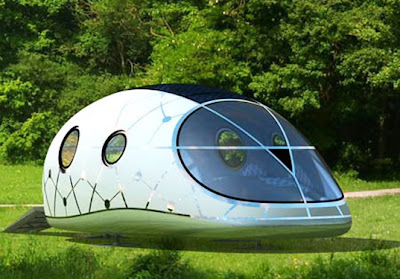 Designed by Jinsun Park and Seonkeun Park. Flower pots are embedded in the unused upper portions of the partitions while an automatic watering system removes the need to water the plants. "The yurt was just beautiful. Scott Nearing built it - with help - in his nineties without using any electrical tools, etc, and it was used for meetings, classes and so on." The mission of The Good Life Center is to perpetuate the philosophies and lifeways promoted and exemplified by Helen and Scott Nearing, two of America’s most inspirational practitioners of simple, frugal and purposeful living. Building on the Nearing legacy, The Good Life Center encourages and supports individual and collective efforts to live sustainably into the future. Guided by the principles of kindness, respect and compassion in relationships with natural and human communities, The Good Life Center promotes active participation in the advancement of social justice, creative integration of the life of the mind, body and spirit, and deliberate choice in living responsibly and harmoniously in an increasingly complicated world. 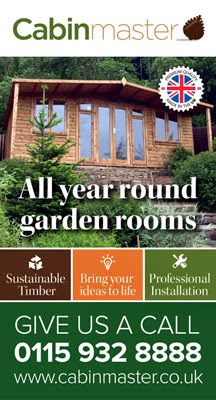 Neil Johnston of Vivid Green has revised his guide ‘Create the perfect garden room’. "There are lots more photos and a rather less earnest approach," he says, "but the detail is still there for those who want it." It's well worth a look. To see a copy, contact him at Vivid Green. "There is no natural light, really. If I close the door, I suffocate, and in the winter I freeze to death. I've carpeted the floors and walls and put up the obligatory egg boxes. And there are dodgy electrics coming in from the house." 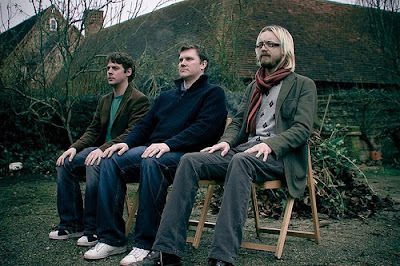 Find out more about them and listen to their sounds at their official site here. Photo by Frances Main. 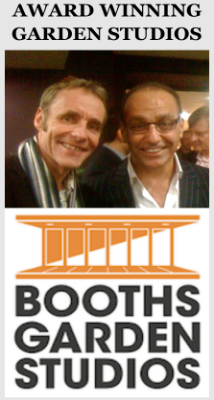 Thanks to Andy Bantock for the alert. 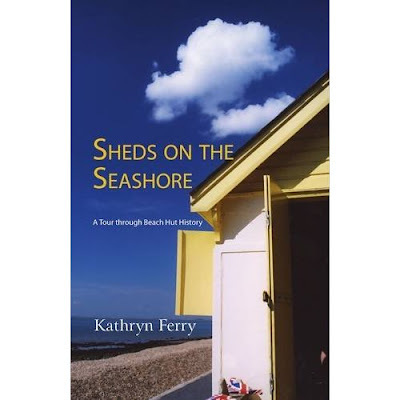 This year has been a particularly fruitful one for those who like books on shedlike atmospheres and the latest addition is the marvellous Sheds on the Seashore by Kathryn Ferry. Subtitled A Tour through Beach Hut History, it's a very readable and excellently researched trip from the beginnings of the beach hut through to its present day renaissance. But it also includes Kathryn's own journey around the beach huts of Britain, taking in some 20,000 examples (I was particularly delighted to discover that all the huts at Woolcombe in Devon have girl's names - there is a photo in the book of Marjorie, Katherine and Matilda) and meeting hutters to discuss their experiences. This human side of the book complements the history very nicely indeed. It's a great read, even if you don't have a beach hut yourself, with plenty of wonderful photos, and a definite must-have for your bookshelf since it's the definitive history and unlikely to be bettered. "Not only does the building look beautiful from the ground, the living roof of sedum, wildflowers and grasses also means it looks visually pleasing from higher up - a plus for neighbouring properties as well as Michael's own view." 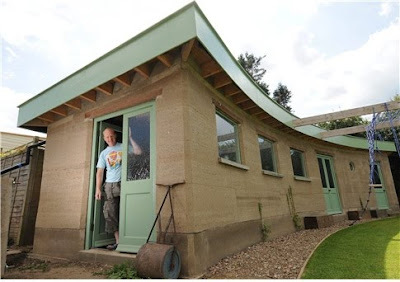 Michael runs classes in building with rammed earth and you can see around the shed during the Green Buildings Open Days, which run 10-13 September as part of the nationwide Heritage Open Days scheme. For more details go to Michael's excellent site. Home business website - and friend of Shedworking - Enterprise Nation , is going on a national road trip to produce a documentary on the rise of shedworking and home businesses in the UK. Starting in Scotland on September 14, a crew of three will travel south to interview home business owners and talk to experts and politicians, with the team expecting to meet over 400 businesses at events and meet-ups over the course of the week. More than two million businesses are run full time from home but the documentary will also take a closer look at what Enterprise Nation has termed the ‘Working 5 to 9’ trend that is seeing millions of people hold down a day job and build a business at nights and weekends, a way of easing out of insecure employment, into self-employment. The Enterprise Nation team will visit home business hotspots in Scotland, North East, London, South West and return home to the West Midlands on September 18. They will film by day and at night host get-togethers for anyone starting and growing a business from home. They will also show how to work whilst on the move in a trip that’s sponsored by communications company, Orange. The trip is being sponsored by Orange, supported by One North East, Business Link for London and Enterprise HQ, with accommodation generously provided by Malmaison Hotels. The crew will be Emma Jones, Founder, Enterprise Nation; Tim Sargent, Mint Video; Nick Clark, 1st Class Travel. 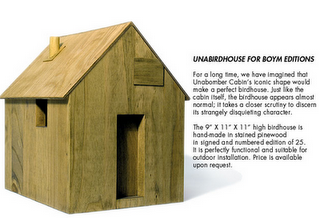 From Boym, a birdhouse modelled on "the Unabomber Cabin's iconic shape". An intersting concept but not sure I would want one in my garden. 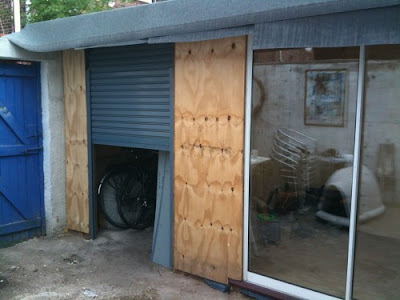 There's been a soft launch for this rather clever site - Sheds.us - from Uncle Wilco of Shedblog and readersheds.co.uk fame. 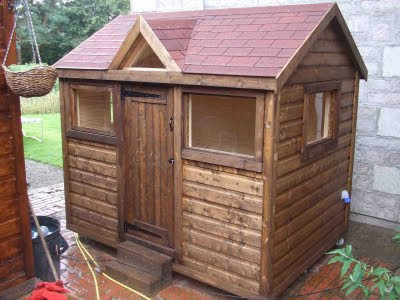 His aim is to provide the best shed comparison site online for the UK market. 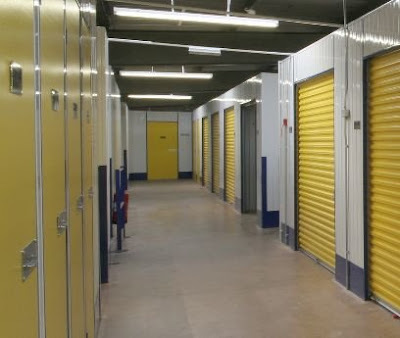 As he says: "Hopefully readersheds will then get a small percentage of the sale, so will help to pay for Shed Week 2010 and that storage shed Mrs Uncle Wilco is after." 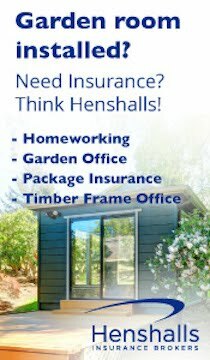 There's a small category for garden offices. 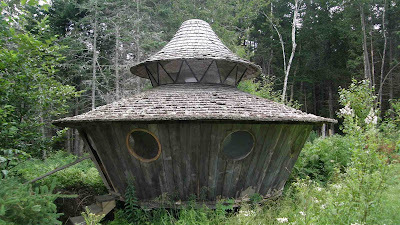 "As a genre the folly gave Europe a wonderful legacy of idiosyncratic, sometimes experimental architecture. 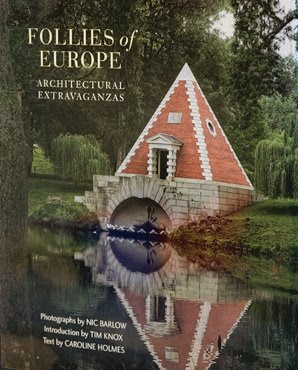 Follies of Europe is a collection of photographs with accompanying text that illustrates the wealth and exuberance of follies, ranging from the Baroque and Rococo through Art Nouveau to the present day. Follies were built for pleasure with passion and self indulgence. They reflect and celebrate the individuals who created them." The pan-European gallery of follies here is particularly unmissable. 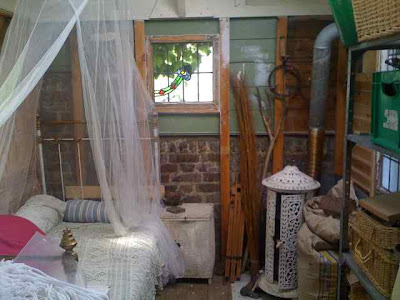 A lovely gallery of photos from Debra Prinzing of ShedStyle. Well worth a browse. 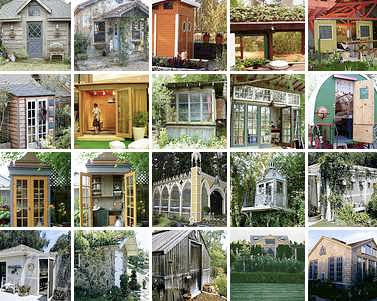 There's a really nice collection of decorated garden sheds at Cleveland.com. It's part of an ongoing series running all summer so do keep checking back: the original article which started it all off is here. 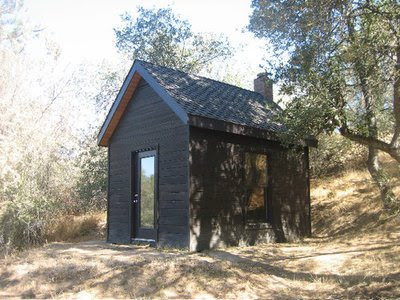 YardPods feels like a much more American term for a place to shedwork than a garden office and so maybe Northern California YardPods is onto an industry winner with their prefab, steel framed buildings designed for your back yard/garden (see here for why they think steel is better than wood). 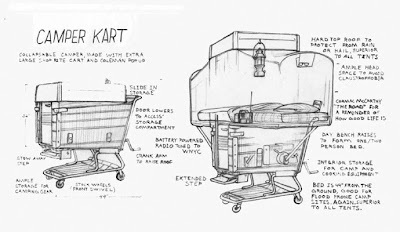 You can get kits to do it yourself or get them to build the whole thing. There are some nice touches - LEED Certified recycled cotton fibre insulation, formaldehyde-free plywood, and a range of roof styles. 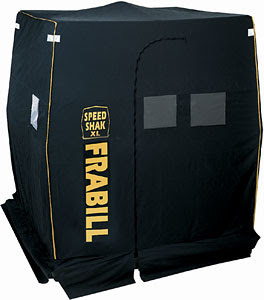 All YardPods are designed and built to order. 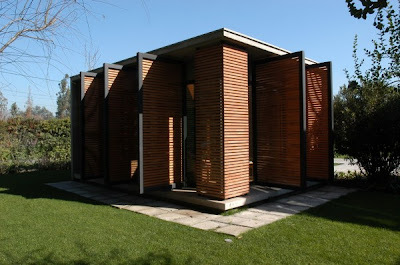 One Grand Designs - one of Shedworking's favourite selfbuild garden office projects - is almost at the finishing line. Do nip along and enjoy this very honest account. The Anywhere Office takes a big picture approach to the philosophies and strategies of living a digital lifestyle and navigating the changing world of work while covering topics such as virtual teams, remote collaboration, mobile work technology, work life balance, and internet marketing. "It is intended as a personal space in which to simply think, using sensory deprivation to exclude the outside world (ear plugs improve this further). This allows you to reach total relaxation as your mind doesn't have to process other signals." “'Green is Good’ may indeed be the business mantra of the 21st century, but it takes a commitment to proven best practices and creative approaches to ensure that ‘green’ means ‘profitable,’” Stringer said. 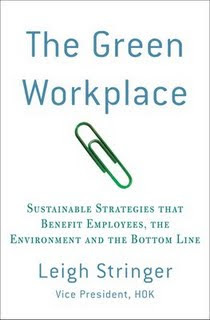 “The Green Workplace draws on the experience of successful green companies to craft a practical resource for helping companies consider how specific actions – big and small – can improve the bottom line while enabling them to better serve their people, stakeholders, communities and natural environment. Mrs Davis had been a self employed chiropodist for 2 years, using two rooms in her home - one as a waiting room and the other for carrying out her practice. She had reached the stage where this was becoming difficult and if she were to continue to grow her business, she would need to either move to a larger house or rent a commercial property. She wanted to continue working from home as she had 2 small children and it was convenient to arrange her appointments around her family commitments. She also felt the rent/rates on a commercial property were above her means. The next thing she did was to look into the possibility of moving house. Her home was valued at £265,000 and the estate agents fees for selling it came to £3900. She estimated that she would need to increase her mortgage by £90,000 to get the larger house she needed. The other charges she identified were for a HIP when the house was put on the market, stamp duty on the new property (estimated to be £5300) as well as removal costs of £670 and solicitors fees of £900. All in all she figured out it would cost her in excess of £10,000 to move, plus the ongoing charges for increased mortgage. By chance Mrs Davis visited her local garden centre one weekend and saw the GBC Group range of Garden Offices. She designed her own building with the help of the staff on site. It was to be partitioned into 2 sections to provide a waiting area and treatment room. The ability to place doors and windows where she chose allowed her to see the best views of her garden whilst keeping an eye on the house. Because the building is fully insulated and double glazed she was able to install her computer and business records therefore freeing up valuable space within her home. Pictured above is the Hallow model from the Malvern Collection available at GBC outlets around the country. 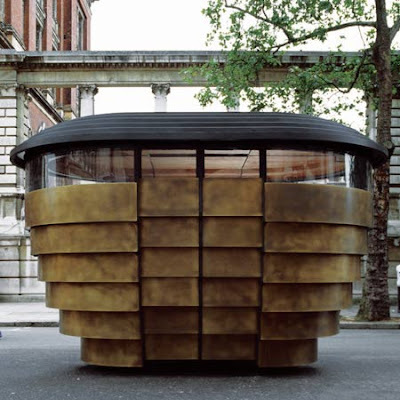 Mercury House One from Architecture and Vision is a "mobile, modular home", a deliberate cross between a car and a living room. There is a solar power element as well as rainwater harvesting option, though slightly strangely it is also made from Carrera marble. 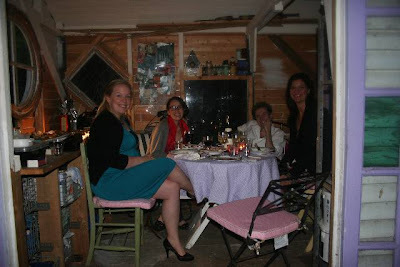 Now here's a marvellous shedworking trend, sheds as 'underground restaurants' (a cross between an unofficial restaurant and a blind date dinner party, as Zoe Williams at The Guardian explains). Pictured above is The Shed, run by two-person team Nicola and Andrew in Newington Green, open weekly on Tuesday nights with a monthly menu rotation. There's a marvellous review of a meal here by one of the unofficial leaders of the movement, the anonymous MsMarmite whose own delights in Kilburn can be enjoyed by booking here. 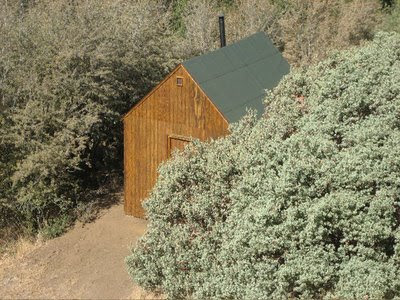 Her own shed - where she cooked this fine meal - was built from recycled materials and includes a bed.